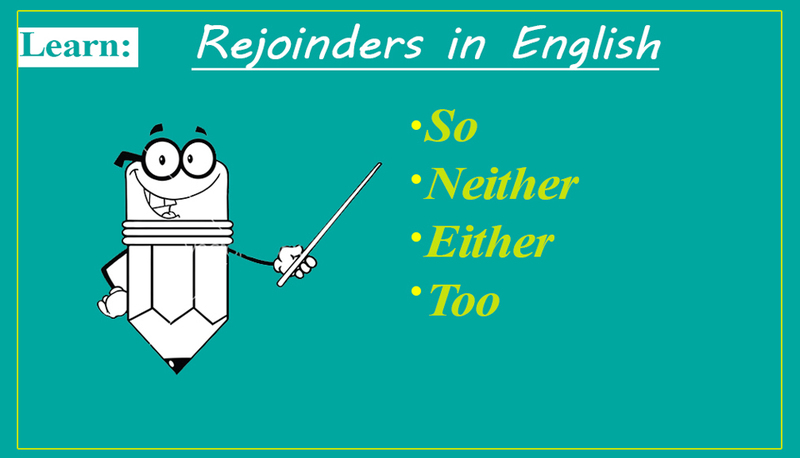 We already have talked about rejoinders in English. In the article below I am going to elaborate the use of so, too, either, and neither in English along with exercise in the end. A: I like ice cream. B: Me, too. or I do, too. or So do I. A: I can play the piano. B: Me, too. or I can, too. or So can I. A: I am hungry. B: Me, too. or I am, too. or So am I. A: I don’t like hamburgers. B: Me, either. or Neither do I. or I don`t either. A: I can’t cook. B: Me, either. or Neither can I. or I can`t either. A: I’m not tired. B: Me either. or Neither am I. or I`m not either. A: I joined the IHLP class at Learnesl yesterday. So did I. or I did too. A: I didn`t go to Mazar –e Shareef during New Year. I didn`t either. or Neither did I. A: I have never been to Iran. I haven`t either. or Neither have I. A: I won`t vote for anyone in coming election. I won`t either. or Neither will I. A: I love fried fish. B: I don’t. C: I don’t either. or Neither do I. A: I am tall. B: I’m not. C: I’m not either. or Neither am I. A: I can sing. B: I can’t. C: I can’t either. or Neither can I. A: I don’t like chocolate. B: I do. C: I do, too. A: I’m not Canadian. B: I am. C: I am, too. A: I can’t speak English. B: I can. C: I can, too. Complete the sentences below by using so, too, either, and neither.